U.S. politicians of the Donkey and Elephant parties during the past few weeks have been busy pounding their chests on the propaganda air-waves to give the illusion of much self worth and power in the faces of the american people when the reality was assured long before the current round of debt crisis play acting ever began in the mainstream media that the debt ceiling WOULD be raised as it ALWAYS has been (about 100 times since it was introduced in 1939)! Meanwhile the mainstream press will continue to pump the story at length on how close the U.S. came towards a debt default and continue to do so in the run up to when the U.S. is next due to hit its revised debt ceiling by early Feb 2014. Understand this the U.S. government will ONLY default on its debts when the markets panic and dump most of the debt they hold, until then the government will continue to print debt and money indefinitely! Understand this that the Debt is never meant to be repaid, instead it is a Ponzi scheme that funds a near perpetual exponentially growing U.S. government annual deficit (same for all governments) that means that the debt mountain will continue to expand exponentially all the way towards eventual hyperinflationary bankruptcy when the only entity left willing to hold US debt (bonds) will be the governments own central bank i.e. 100% QE, which would mean the Fed monetize's ALL US government debt. The US central bank has already monetized approx 12% of US debt to date. However this masks the fact that ALL central banks have monetized U.S. debt at the level of an additional approx 38%, so approx 50% of US debt has been monetized by the worlds central banks! (It's a little more complicated as US commercial banks (ponzi scheme accomplices) are also encouraged to buy US debt as well, approx another 8%). Therefore DEBT DEFAULT does not occur when chest pounding gorillas on Capital Hill vote to make it happen. No, DEBT DEFAULT starts when first the markets dump most of the approx 50% of U.S. treasuries they hold and then soon afterwards foreign central banks give up the fight of trying to defend the collapsing dollar and also cut their losses to dump US treasury bonds, releasing a flood of dollars that the US central bank attempts to defend the collapse in value of by PRINTING EVEN MORE DOLLARS + Announcing capital controls to try and stop the PANIC selling of U.S. bonds (dollars) by buying them, resulting in an HYPERINFLATIONARY PANIC EVENT (note this is not a forecast as hyperinflation is NOT imminent, but this is just an explanation of how the US would actually default on its debts). 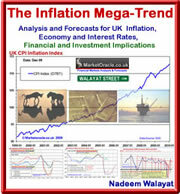 Meanwhile ongoing deficits inducing Debt and Money printing CAUSES INFLATION, and as the below graph illustrates that the Inflation mega-trend is EXPONENTIAL. The financial crisis has given the general population a window into the reality of the system of slavery that exists in the west to the extent that the bankster elite rule the country and not the politicians who in large part are nothing more than propaganda servants in the service of their elite masters whom they hope to eventually join the ranks of on leaving office. This is why instead of holding the bankster criminal elite to account the politicians have in action rather than rhetoric gone out if their way to protect their masters, which means in Britain no bankster's have even been charged with a crime let alone gone to prison, instead they have ALL been BAILED OUT to UNLIMITED extent by ordinary tax payers, by the SLAVES who work for the elites in their factories, offices and retail outlets. 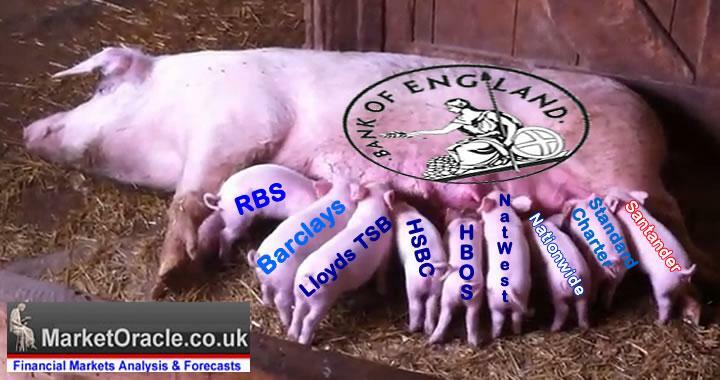 So all that happens each time a new bankster elite fraud is revealed is that the UK Treasury and Bank of England step forward to bail out the banks with ever escalating amounts of tax payer monies all the whilst deploying mainstream media smoke and mirrors to hide the extent of the bailouts, as exampled by the mis-selling scandals with another scandal revealed virtually every other month such as PPI mis-selling and the tens of billions that will need to be paid out as compensation for the LIBOR price fixing fraud, whilst the Bank of England's brethren continue to bank billions in bonuses on the basis of fictitious taxed wage slaves funded profits. Meanwhile the politicians play with smoke and mirrors such as alluding to the fact that the share prices of many tax payer bailed out banks are now showing a profit. What they fail to mention is that the Bank of England has stuffed the banks full of some £500 billion of free money to ensure that the stock prices would be inflated so that the Politicians can announce a small profit on for instance the £40 billion capital injection in LLoyds HBOS, that I am sure the share holdings will be sold at a deep discount to the bankster elite just as Royal Mail had recently been sold for just £1.7 billion after the companies debts and liabilities such as the pension's liability of £12 billion was dumped onto tax payers. In total the cost to the tax payers could be as high as £20 billion for a £1.7 billion return. The Liberal Democrats betrayal of virtually everything that they stood for from student tuition fees to electoral reforms, to rail fares illustrates the degree to which virtually ALL politicians SYSTEMATICALLY LIE. The truth is that in today's western democracies politicians just cannot get elected unless they LIE. At every election promises are made and after every election virtually NONE are kept! Because politicians primarily serve the interests of the ruling elite and the primary purpose of politics is to create a dense layer of smoke and mirrors for the elite to hide behind so as to continue to keep the slave populations as docile and as productive as possible, which is far more difficult to achieve under dictatorships which tends to result in far less productive slaves. At this point I can imagine that many people will be arguing that countries such as Britain have the welfare state and the NHS and myriad of other state interventions that support the general population. However, that is just what all farmers do, they tend to look after their live stock! The elite want healthy baby slaves to be born and then looked after, educated upto a certain level and kept in good health so as to maximise their productive capacity in the service of the elite. But slaves who imagine that by educating themselves to a high level will allow them to gain freedom will soon find themselves saddled with increasing amounts of debt for the whole of their lives for that is how the debt based system of slavery is designed to work. For most people all that more education will achieve is an even greater amount of debt. Like wise when slaves cease to be productive they are dealt with by systematically taking away much of the wealth they may have accumulated and finally being eliminated by the NHS. Many readers will assume that democracy is the final destination for societies, but the reality is one of COMPETING ELITE's which means that it is only a question of time before a powerful elite emerges that seeks to further concentrate power in their hands, and so today's democracies could easily become tomorrows dictatorships, for an example of this we only need to look at modern Russia which went from a Tyranny to Democracy to Oligarchy back to Dictatorship, all within 20 years! My next in depth analysis will be Governments Inflating Housing Bubbles to Encourage Debt Slaves to Borrow. Ensure you remain subscribed to my always FREE newsletter to receive this analysis in your email in box during the coming week. Watching some of the mainstream financial commentary over the last week has been both funny and scary. The general consensus is that raising the debt limit constitutes paying bills rather than failing to (try telling that one to your bank manager! ), and that default is impossible because the U.S can print money forever. The biggest laugh of all were the Bloomberg panel that unanimously agreed that the Remnimbi would never replace the Dollar as a world trade or reserve currency because "we have the rule of law" !!!!! Meanwhile, in a recent correspondence with the B.O.E a representative reassured me that QE in no way reduced government debt or contributed to government spending. He also denied buying government bonds from banks but did not mention where the banks got their money from to buy government bonds. We really are in a twilight zone. Any comments Nadeem? I can forward you Roger Beatons reply in full if you wish to see it!